Humanity agrees on very little, but we have decided this much: beer is good. Beer is older than democracy, more popular than Jesus, and is enjoyed by Fascists, Communists, Feminists, Sadists, Masochists, Gays, Straights, the Bi-Curious, Polygamists, Polytheists, Monotheists, and Atheists alike. Beer is mentioned in the Sumerian epic Gilgamesh, which is the oldest work of fiction in the world. Beer has been regarded as a gift of the gods by the Egyptians and the Germans and was used as currency during the Middle Ages. Beer advertising is everywhere, even on buses, and it's strange to think that beer was illegal just 80 years ago. There are still “temperance advocates” out there somewhere, one imagines, but they must realize that they are fighting a losing battle, like the Lyndon LaRouche for President people. Light beer has been around a much shorter time. It was invented not by the Sumerians, but by this guy in the late 1960s. Basically, light beer is beer with fewer calories and less alcohol than ordinary beer. You would think that a product like that would have limited commercial appeal—how many calorie-counting alcoholics can there be?--but you would be very, very wrong. Today, light beers dominate the US market, with six of the top 10 best selling beers of 2008 being “light,” including Michelob Ultra Light, whose advertisements feature athletic exercise enthusiasts who probably don't drink beer, and Miller “Lite,” who apparently does not employ a copy editor. The best selling beer of 2008 was Bud Light (even Obama drinks it! ), and since I have had Bud Light before, my natural reaction to this bit of information was to wonder why, in Gilgamesh's name, are so many people drinking this beer? Could people be drinking light beer for the taste? 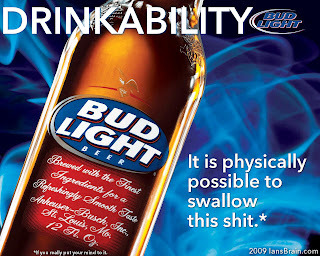 Taste is subjective, and if I think Bud Light tastes like piss, perhaps that's due to a defect in my palate. Some people enjoy tofu, others eat dog, diff'rent strokes make the world go 'round. But surely, no one thinks of Bud Light as their favorite beer. It doesn't taste exactly like water, but it tastes more like water than beer normally does. It's the beer you drink when you don't like the taste of beer very much, yet you are mysteriously drawn to consume it rather than, say, switching to vodka or not drinking at all. I doubt that if you polled light beer drinkers they would start extolling the virtues of Bud Light's subtle flavoring, or Miller Lite's aftertaste. They just drink it because it's beer, it's cheap, and you don't need to think about purchasing it. If you want to buy a fancy microbrew you have to spend a lot of time looking at the bottles, picking between them, and you risk picking something that you'll really dislike, like the time I bought Dogfish Head's Raison D'etre without realizing that they made it with actual raisins. There's no risk in light beer. In some respects, the true inventors of light beer are not the chemists who came up with the idea and tweaked the formula over the years, but the advertisers who convinced people to drink it. There are more chemicals in light beer than in your standard microbrew (at one point Miller Lite had corn syrup in it), and what flavor there is these beers is artificially added (some Bud Light is “Autumn Wheat” flavored, and that's not a naturally occurring taste). Yet we've been conditioned to think of light beer as the norm and ordinary lagers, stouts, and porters as “weird.” Light beer ad campaigns beat you over the head with their popularity—everyone likes it, so you should too—or they compare themselves to other light beers, as if light beer was the only kind of beer in the world. And people buy into the ad campaigns, or they buy the beer at least, which comes down to the same thing. The reason light beer sells better is because of the regulations in the market for beer. Alcohol has a three tiered regulatory system of production, distribution and retail. In most states, you can only be part of one of the tiers. Watch the movie "Beer Wars". It explains how craft breweries have the deck stacked against them because of the regs.